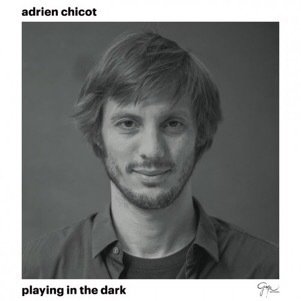 A native of Paris, pianist Adrien Chicot was self taught from childhood, before joining the IACP, a school led by the Belmondo brothers which is now seeing the emergence of a new generation of talented jazz musicians, including Samy Thiebault, Julien Alour, Alexandre Freiman and Geraldine Laurent, to name but a few and “Playing in the dark” is Chicot’s second album and as the first; “”All in”, it is a piano, bass and drums trio affair where intelligent composition meets passionate performance. The line-up for this recording is also the same as the previous outing, with bassist Sylvain Romano and drummer Jean-Pierre Arnaud joining Chicot on piano. The album will be celebrated with a live performance from the trio at Duc des Lombards, Paris, on Thursday March 16th.